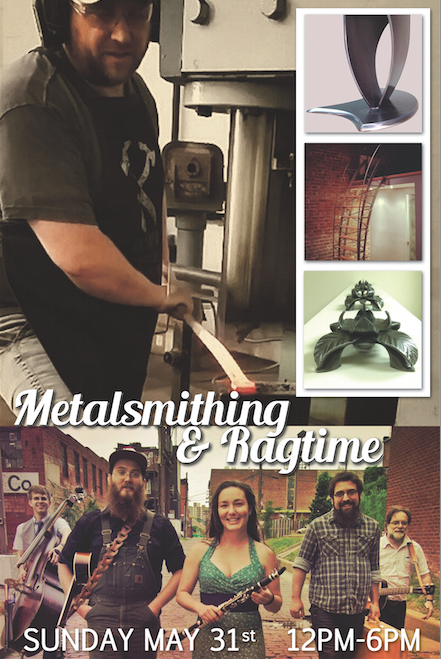 “Jesse Robinson is a metalsmith who uses the traditional blacksmithing way to produce unique art pieces made out of metal. Jesse’s work has been exhibited at the National Ornamental Metals Museum in Memphis, The James Renwick Alliance, a support group for the Renwick Gallery in DC and he has worked with several leading interior designers in the DC area. You can see more of his work at Robinson Forged Metals. At the open house, Jesse we will be demoing on a forge how he crafts his work as well as displaying some of his latest work. The 2014 Washington, DC Area Music Award winner for Best Folk/Traditional Group (ragtime) band the Bumper Jacksons will also be at the open house playing some of their new songs!